Home | Top 10 Marin Kids' Birthday Party Venues! 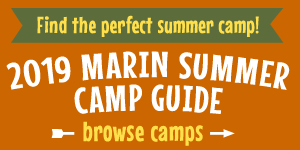 You can browse more Marin birthday party venues on our Marin Birthday Party Guide, as well as search for entertainers, caterers, party supplies, bounce houses, and more. Nobody throws a birthday party like the Bay Area Discovery Museum (BADM)! All BADM birthday parties include: all-day admission for guests, staff help with setup and cleanup and free parking in front to the museum. Choose from customizable packages available in 3 private rooms throughout the museum, Discovery Studio, Playhouse or Discovery Theater. Birthday party guests have full use of museum exhibits and free programs, too! BADM members get a credit on any party. Find more info here. Located in San Rafael, Marin's only bowling alley offers 40 lanes, automatic scoring, and plenty of bumper lanes for the little ones. On-site food is provided by Villa York Pizza and Grill, and they even have over a dozen beers on tap. In case that's enough, they have pool tables and an arcade, too. Several different birthday party packages are available; call (415) 456-4661 to book your lanes. Check their website for hours and pricing. Kids can have a ball and burn off some energy at GymWorld's action-packed birthday birthday parties. Parties at this popular San Rafael gymnastics center take place on Saturday and Sunday afternoons and run for about an hour and a half. Birthday parties can be tailored to your child’s needs. You will have full use of the facility and one of their coaches will teach and supervise games, teaching gymnastics, and using our tire swing, trapeeze, foam pit, climbing wall, trampoline and tumbling floor. Find out more info here. Novato's Love2Dance is not only a great place for dance classes, but for active themed birthday parties as well! Love2Dance offers fun, customizable party options for boys, girls, teens and adults. With two large event spaces Love2Dance can help you plan your next party! Enjoy their state-of -the-art sound system, festive DJ lights, and dance the night away to your favorite tunes. Their projector is available to display movies for a Hollywood movie party or to use as a background for a dance party. Love2Dance provides all the decorations and suppiles, and you bring snacks, beverages, and the cake! Find out more info here. 1559 H South Novato Blvd. This popular natural history museum and nature center in Novato offers fun and educational live animal birthday bashes where kids can get up close and personal with their resident reptiles, amphibians, insects, arachnids, and other creepy-crawlies. Mrs. V has hosted over 100 fun birthday parties. The two-hours she hosts include 10-15 minutes for guests to arrive, 1-hour animal program, 30-40 minutes to eat and serve cake, and 10-15 minutes for clean up. Ages 4 years and up. Whether indoors at our museum, or outdoors at a local park, we guarantee a fun and educational time for children and parents alike! Find out more info here. The Mill Valley Community Center on Camino Alto is home to one of Marin County's only indoor pools. They offer Big Splash Pool Parties there for kids ages 7 and up, with swimming (including the slide) and use of the party room for two hours total. Mill Valley Recreation also offers a variety of different theme parties, including NYE-ish, Movement & Music with Jamaroo Kids (2-4 years old), Jumpee House Party (3 years +), Storytime with Puppets Party (3-10 years old), Dance Your Socks Off Party (5-10 years), The Artist Within Party (5-12 years), Karate Kick-off Party (5-10 years old), and Sports Play Party (5-10 years old). Call (415) 383-1370 ext. 4720 for more info and availability. Find out more info here. Pony parties come complete with 1 hour of hand led Pony Rides, a trip to our Petting Zoo and use of the Play Structure. The party area is located in a shady apple orchard with picnic tables and plenty of room to play. Pony rides are approximately 5 - 7 minutes long and loop around our scenic grounds. A typical party starts with pony rides for the 1st hour followed by a trip to the petting zoo. A hand washing station is nearby for use before eating. Pony parties can be fun for children through 8 years of age. Pony Parties can be held on rainy days, too, in Morning Star Farm's covered riding arena. Find out more info here. This indoor bounce house experience at the MLK Gym in Sausalito features bounce houses, a 40-by-20-foot sports arena, a 15-foot slide, and a toddler bounce zone. PlayLand offers birthday parties for up to 14 kids, complete with balloons and a private cake room. All Playland Indoor Jumpy House parties get 3 full size inflatable jumpy houses, balloon animals to take home and fun Rocket Balloons for the kids to play with. We've attended parties here and it's a blast! Other party options, including outdoor parties, are available, too. Find more info here. San Anselmo's awesome LEGO center is a paradise for lovers of the popular plastic building bricks. They offer parties either in-house at their Play Well TEKnologies in San Anselmo or at the location of your choice for children ages 5 and up. Choose from a variety of different LEGO projects, including building tunnels, castles, pyramids, and motorizined planes, cars, and trains. They also offer drop-in play for kids ages 2 and up. They also stock a wide variety of LEGO sets, as well as other brands of building sets. Find out more info here. This happening art studio with locations in downtown Novato and Mill Valley offers hands-on kids' art parties. Their Novato studio parties are appropriate for ages 2-adult and can accommodate 8-20 children or 8-15 adults. The Mill Valley studio is for younger creators and appropriate for ages 2-8 and can accommodate 6-10 children. Both studios are yours with 1.5 hours of party time, and 15 minutes set-up. Kids can create amazing mosaics, clay sculptures, paintings, drawings and more! Ceramics, sewing, screenprinting, printmaking, are a few options. Owner Kebby and her staff are helpful and inspiring and bring out the creativity in everyone. We've been to numerous parties and classes here and it's always a great experience. Find out more info here.